I met Tracy of RubySpiritDesigns on Folksy, and was keen to learn more about her. I always like to get straight to an artist's scifi credentials! Star Wars, purely for the Yoda factor. Ooh, and Ewan McGregor. But mostly Yoda! Sunday dinner cooked by my hubby - Yorkshire puds and lots of veggies! In the shower your book gets wet. What brought you to Folksy? Do you sell anywhere else? I discovered Folksy by chance in December. It was during one of those freeflow internet bimbles, where you start off looking for something and then realise that a couple of hours has passed just following a random stream of links. I already had a shop on Etsy http://www.rubyspiritdesigns.etsy.com with a minimal amount of items, but felt really positive about joining Folksy with it being UK-based. http://www.rubyspiritdesigns.co.uk. I have some items in a lovely gallery in the next village to where we live, it's called Projeto and is owned by another Folksyer. When littlest starts school in September I'll be able to put more daylight hours in and hopefully do a few craft shows as well! My Folksy shop has the most varied stock, I try to keep a good range of colours, styles and also prices. Many of the things I make are one offs because I love to work with broken vintage jewellery, pulling it apart and making it into something completely different. As a family we do our best to recycle everything and I love the fact that I can carry that over into my work! It breaks my heart to think of all the beautiful things people throw away because they've got a broken clasp or have lost a few stones. What's the favourite item you've made so far? 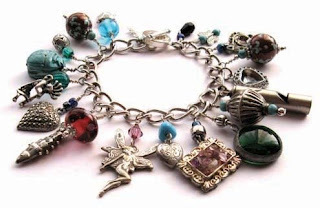 That would have to be the charm bracelet I made for myself, it has lots of little memories attached to it - bits of earrings from when I was a teenage goth, broken jewellery from my mum and my gran, a whistle from the first necklace I had as a child. 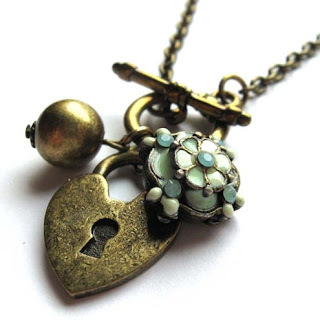 My favourite item in my shop would have to be the Secret Heart necklace. I love it so much I've even used the picture for my avatar! What has been the most useful lesson you've learnt (about Folksy) so far? To not feel uncomfortable about asking for advice or criticism in the forums! Folksy is still a phenomenally friendly site and people are very supportive of each other. It's so handy to have a group of like-minded people at your disposal for help and advice. If you could start again, is there anything you'd do differently? All I would have done is start sooner! I spent too many years working really hard for other people's benefit because I didn't have the confidence to start up on my own. Now I can't imagine doing anything else. It is a part-time operation at the moment but I have so many plans for September! I'm planning on making some things entirely from scratch, including making lampwork glass beads. I'd like to make bespoke lampwork so that people could request completely bizarre colour combinations that you perhaps wouldn't normally see. We have a shed in the garden which needs a bit of work, but hopefully I'll be in there with my torch before the summer. However I love the things I've made by recycling old stuff so there's always going to be a lot of that going on! I'd also like to broaden my range to include things other than jewellery, so watch this space! What have you been doing today that I've interrupted? We bought an old Adana eight-five press recently and it has been an ongoing process of sorting the huge amount of type we got with it. At the moment it's in the kitchen, so it's just been ten minutes here & there whilst the kids are eating tea or whatever. This will also be going into the shed, hubby has a Folksy shop called Dig The Earth where he sells cards so he'll probably decide to sell some letterpress items as well. I just love the memories it brings back of setting type by hand at college! What's your top marketing tip for today? Have confidence in your abilities and believe in the things you create. This positivity will come across to your customers. Also wrap things beautifully and always include a couple of business cards, one for them and one for their friends! Go Tracy, go! 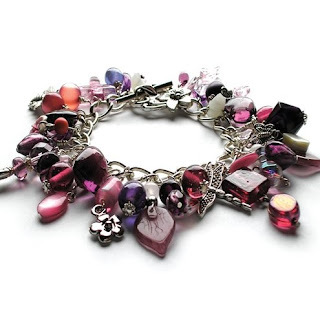 We love your jewellery at Keighley Arts Factory. Thanks for the interview nifty! I really enjoyed my little spot ib the limelight ;). And cheers for the lovely comment Jo! 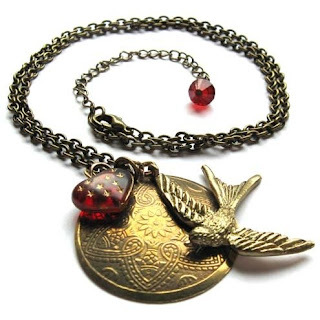 I agree, the secret heart is really a most beautiful piece... lovely to find out more about the heart behind RubySpiritDesigns, and looking forward to seeing what marvellous things will be created with that press! Ooh, lovely jewellery and great interview. Thanks for another great interview Nifty! And very pretty and unique jewellery Ruby! I love reading about other crafty folk. Really intersting thank you. Off to check out Rubyspirits shop on folksy. Lovely jewellery and what a nice interview! Nifty, you do great interviews 'cos you ask all the questions I want to read the answers to! Looking forward to seeing lots more in your shop, Tracy! I really like your new direction and I feel you'll do well with it. Well Linden, I feel it's important to know where people stand on the important issues - Star Trek/Star Wars in particular.